Happy Friday everyone! I've been super busy lately, building and getting ready to attend Haven Conference in Atlanta next week. Representing Simpson Strong-Tie, I'll be there with my good friend Jen Woodhouse, showing you how to build a cool outdoor ottoman which Jen designed. 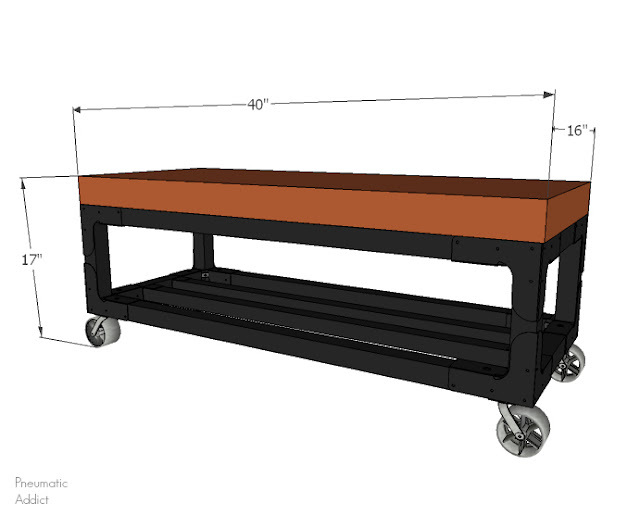 As a brand ambassador, I've had the chance to build some pretty cool things using Simpson Strong-Tie® products (like my Tall Printers Cabinet and my Rolling Outdoor Island). 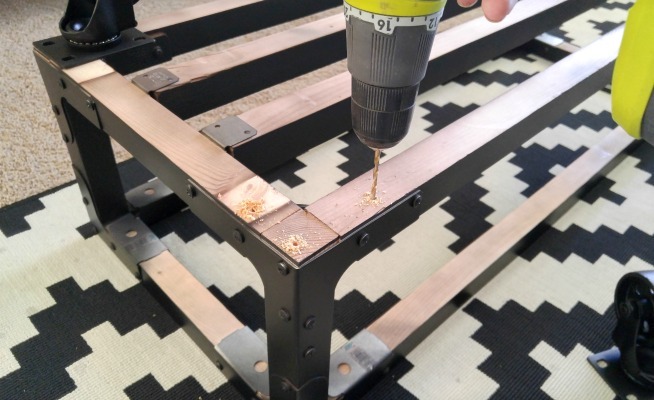 Today, I want to share an easy furniture building project even a beginner builder could master. 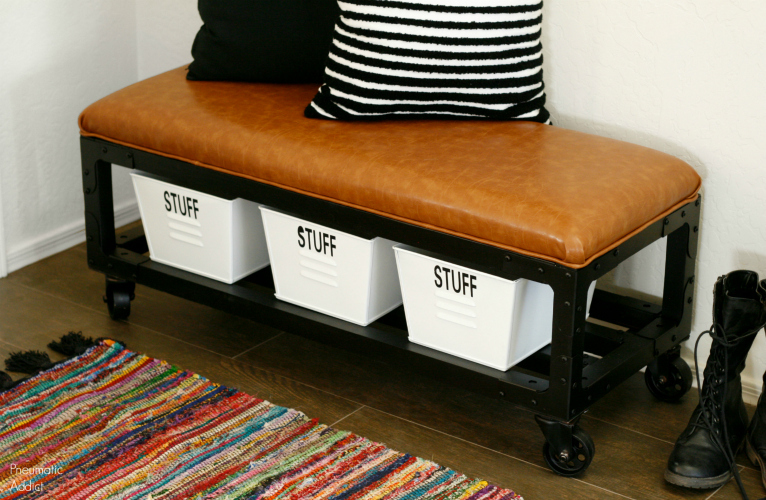 Just about every house has a place that could use a storage bench. 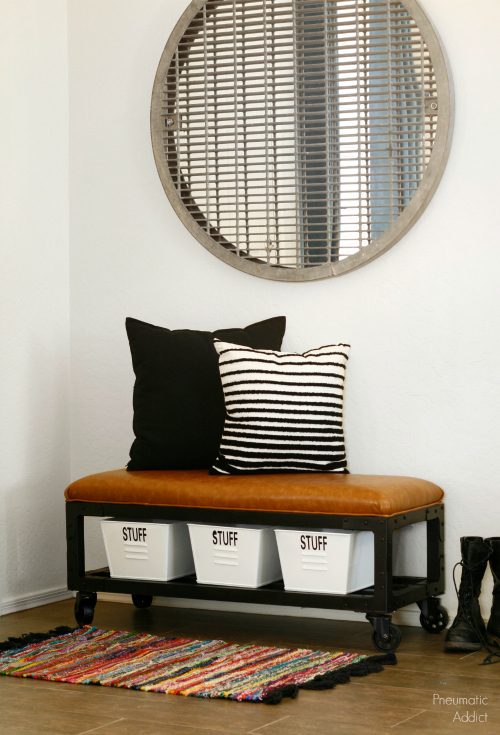 If you're like us, you have an entry way or mudroom with smelly shoes laying around. 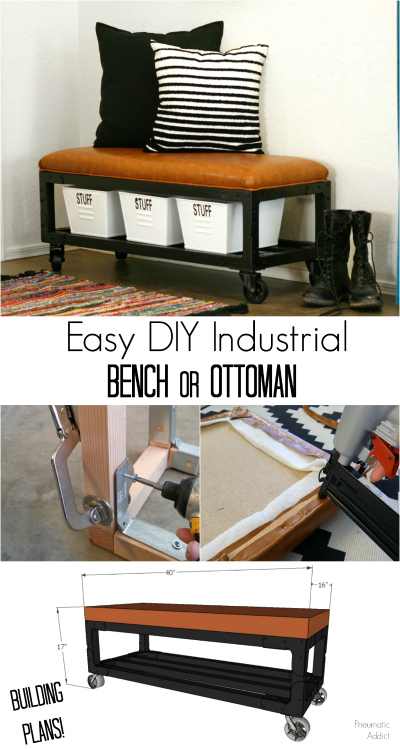 Or maybe you've been looking for building plans for a wood and leather ottoman. Well, I've got you covered my friends. Just scroll down. 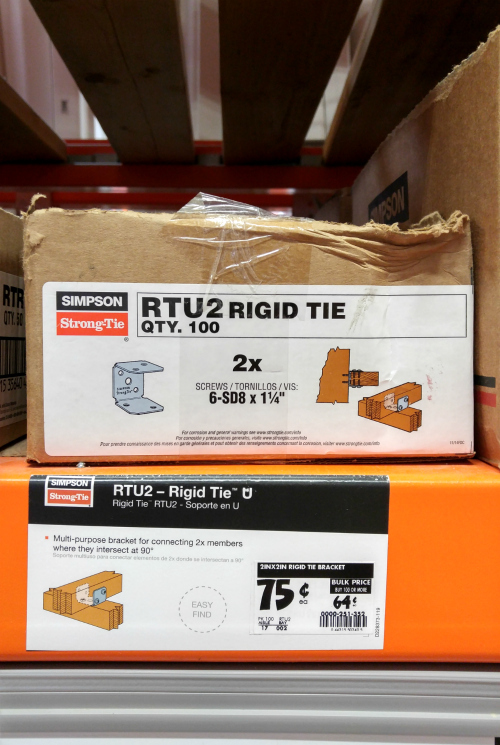 *This post is sponsored by Simpson Strong-Tie and contains affiliate links. (4) 2 x 2 @ 36-7/8"
(2) 2 x 2 @ 36-5/8"
(4) 2 x 2 @ 12-7/8"
(4) 2 x 2 @ 10"
(1) 1/2" plywood @ 16" x 40"
(1) 2" upholstery foam @ 16" x 40"
1. The first thing I did was to cut all my lumber to length, following the cut list above. Next, I started attaching a RTC22 connector on each end of the 10" posts, using 1-1/4" Wafer Head Screws. 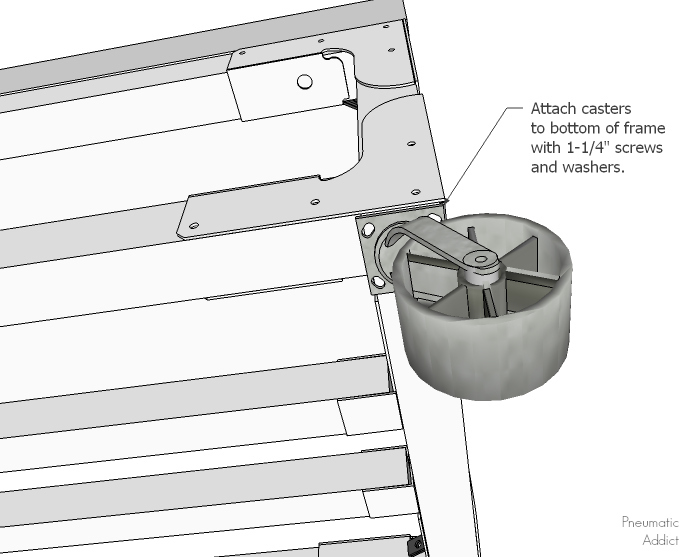 These screws from Simpson Strong-Tie are self-tapping (meaning no pre-drilling required) and the wafer head is designed to work with steel connectors. I turned the connectors so the vertical side (the side with curved edges) faced towards the inside of the post. 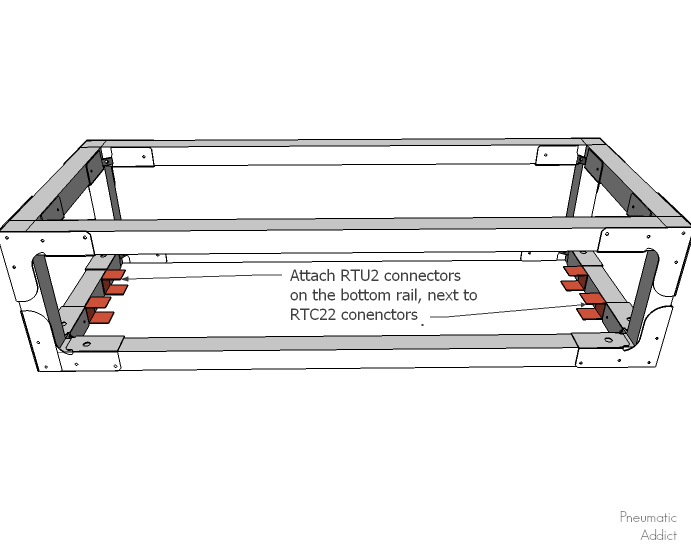 Make sure you bought RTC22 connectors, not RTC2Z connectors. 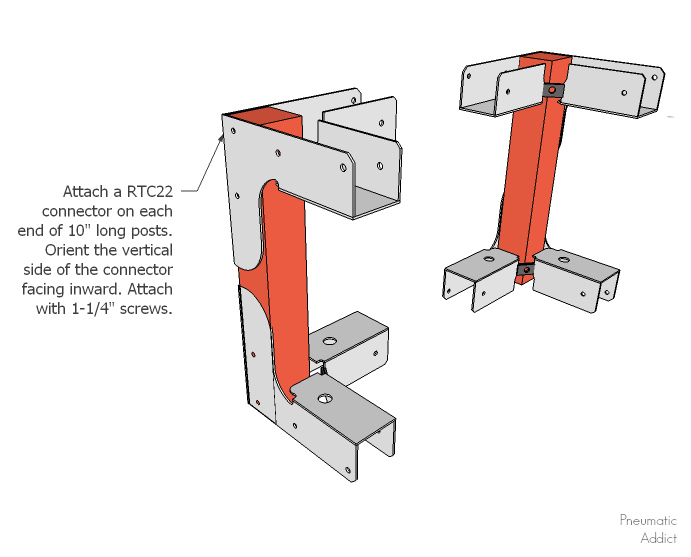 The RTC22 connectors are designed to fit perfectly on 2 x 2 posts, without hanging over. My local Home Depot no longer carries them, so I had to order mine. My 2 x 2's were almost exactly 1-1/2" on both sides. The arms of the RTC22 connector are only about 1-3/8" deep, so to make sure my boards are flush, I offset the connector about 1/8" from the end of my 10" vertical post (check out the photo below). 2. Once all eight RTC22 connectors were attached, I connected two vertical posts to each other by inserting 12-7/8" into the connector and attaching with 1-1/4" screws. I ended up with two rectangular end pieces. I came up with a little trick to make sure my boards are seated correctly in the connector. 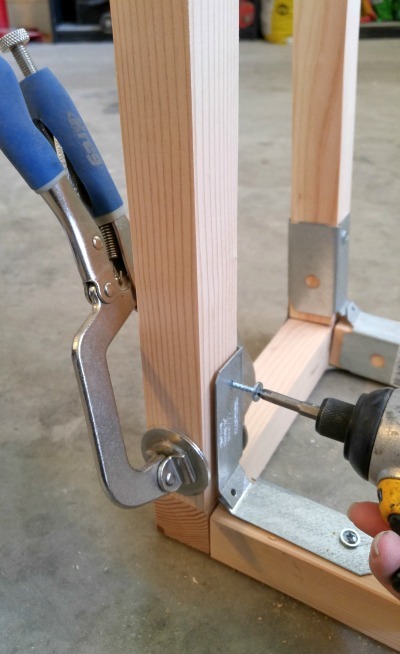 I used a small clamp to hold the board in place, while driving the screws. 3. 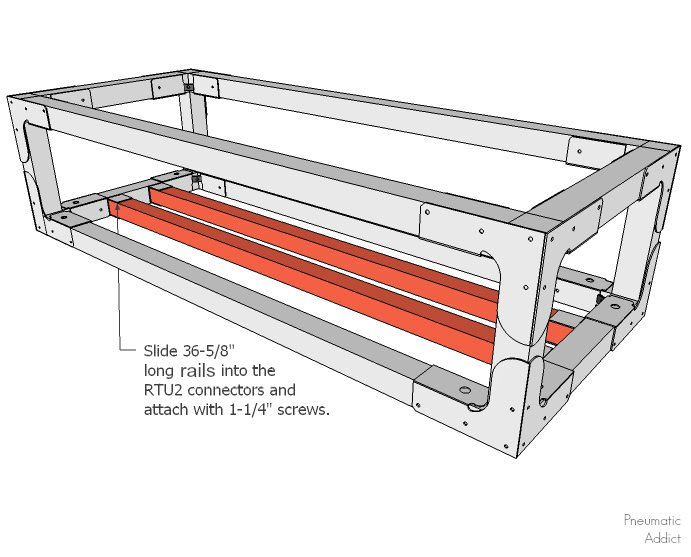 Next, I joined the two end pieces together with four, 36-7/8" long rails. In addition to the pre-drilled holes on the outside and inside faces of the RTC22 connector, there are two small flanges on the inside corner, each with a hole drilled in the center. These are to help keep your structure square. 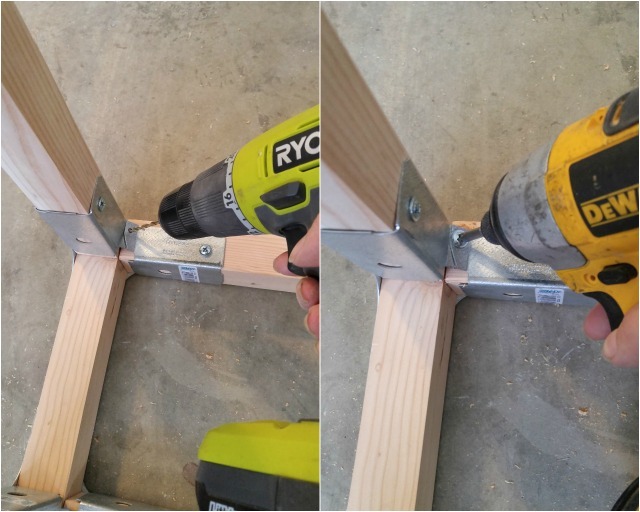 I inserted a 1/8" drill bit through both holes and drilled about half way through the wood post. 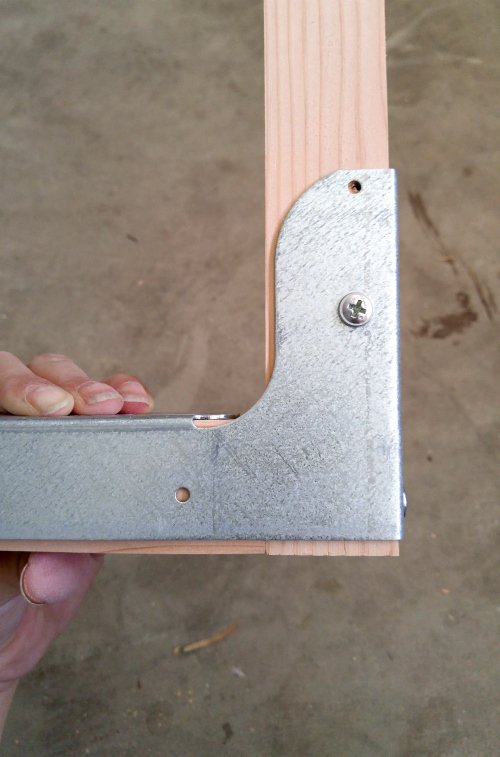 Next, I drove a 1-1/4" screw, holding my corner tightly in place. 4. There are a couple different ways to attach the rails for the lower shelf. You could use pocket holes, but I used four RTU2 connectors. 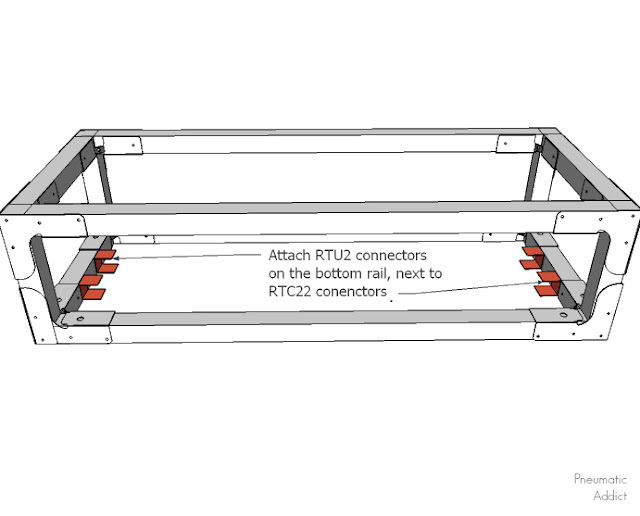 Using more 1-1/4" screws, I attached a RTU2 connector immediately next to each RTC22 connector on the bottom side rails. Then, I slid the 36-5/8" rails into the connectors and secured with more screws. At this point, I took the frame and casters outside for paint. I sprayed everything with a coat of primer and two coats of matte black spray paint. 5. With the basic frame of the bench built and painted, I was ready to attach the cushion. I cut my 1/2" plywood down to size (16" x 40") and upholstered it just like I did with this bench, minus the tufting. I flipped my upholstered cushion over and laid it on the floor. 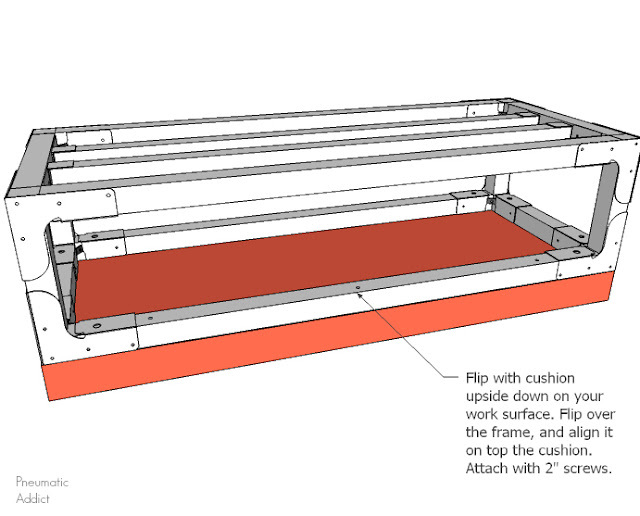 Next, I flipped the bench frame over and aligned it on top of the cushion. 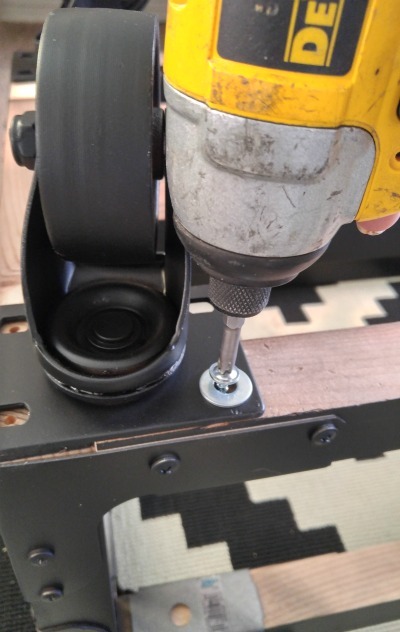 I pre-drilled through the underside of the top rails, and connected the frame to the cushion with 2" wood screws. 6. The last step was to attach the steel casters to the bottom on the frame. I aligned a caster in each corner, marked the holes, and pre-drilled shallow holes, just to make the screws easier to start. I inserted my screws through small washers, and drove them in place. 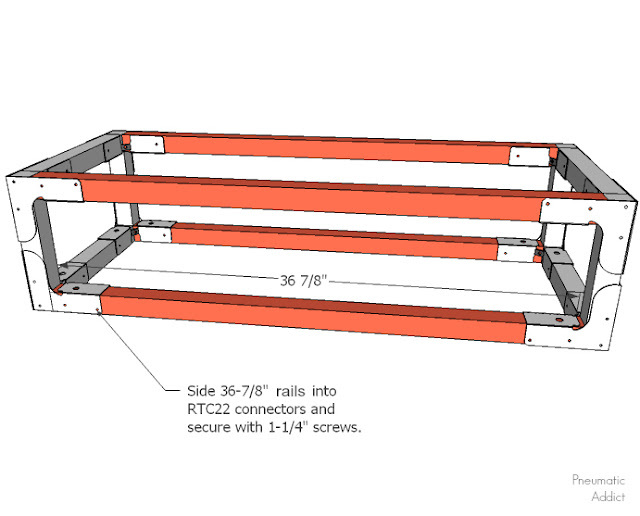 The lower shelf will accommodate baskets or crates up to 7" tall. I found these cute little "stuff" bins at At Home (A.K.A. my new obsession). The bare wood and steel connectors looked so cool the way they were, I was temped not the paint the frame. I ended up going with matte black to match my kitchen table and DIY picture frame. I love how it looks! What do you think? Are you ready to build your own easy entryway or mudroom bench? Pin the image below to save the idea for later. 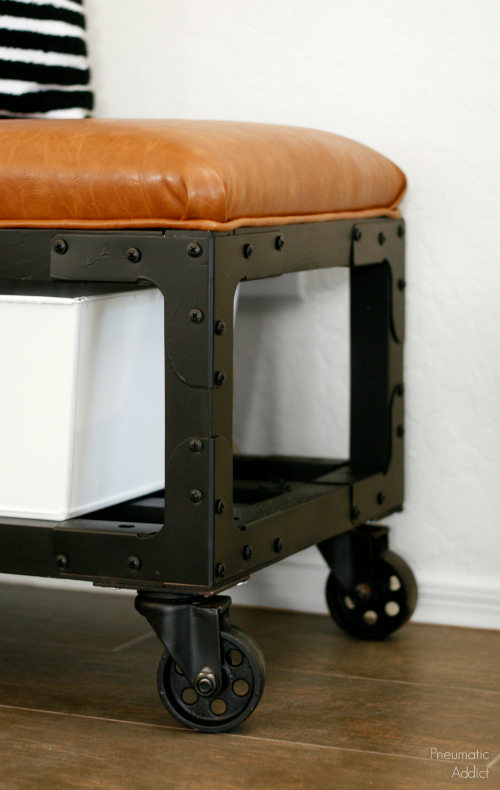 LOVE the finishes you chose for this awesome DIY! Great project! Thanks Julie! I'm a sucker for matte black. Thanks Sara! I missed you you too :( Feel better soon! This is such a practical piece of furniture to have in the house. 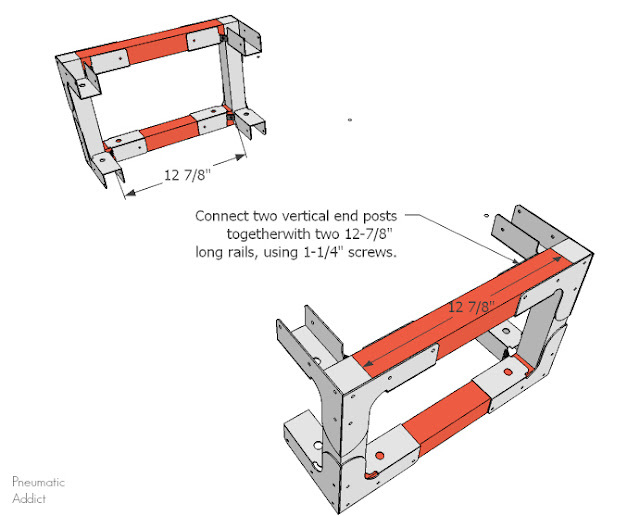 I would love to tackle something like this; thanks for the great plans! Thanks Colleen! It wasn't too difficult. You should totally give it a shot! I would love to see pictures of the finished product. Thanks lady! I take that as a major compliment coming from you. Awesome sauce! Love this bench!